The name Verbena, in the language of flowers, signifies enchantment. The genus Verbena includes about one hundred and ten species, often of a weedy character. 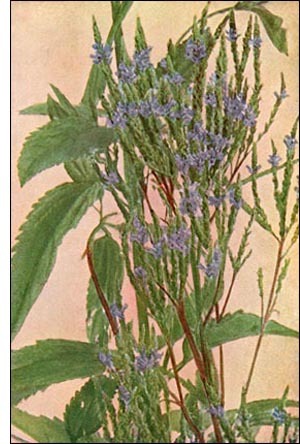 The Blue Vervain is one of the weedy members of the genus. It is common along our waysides, and, with its erect form and long spikes of blue flowers, would be quite attractive could the flowers all mature at the same time. It has frequently been placed under cultivation, but has little value as a garden flower. But in the waste grounds of roadsides it is a pleasing sight even if its leaves are gray with dust. This plant is sometimes called Simpler's Joy. It was given this name because in years gone by it was a popular herb with the " simplers," or gatherers of medicinal plants.